SmallBizBits | Small Biz is the backbone of our economy. It's about time everyone knew it. Did you know that for every month you are NOT in contact with your clients and customers, you lose about 10% of the value of your relationship with them? How often are you in touch with your clients and customers? A monthly newsletter is an ideal way to stay in touch with clients and customers, it is inexpensive, and really is not that hard to do. Remember, it is much more cost-effective to do whatever it takes to keep your current clients and customers than it is to try to woo new ones. Your current clientele is like gold! Even if they only buy a one-time item from you, don’t forget that they are excellent sources of diversified marketing strategies or for referrals. Referrals are not to be discounted. Without referrals, your business influence is severely limited. A personal touch from you, the owner of the business. Some people write a quick note to their readers. Others place editorial comments throughout the newsletter with their name after the comment. Educate your clients and customers. This is a great place to let people know how best to use your products and services. You might even consider highlighting other clients and customers and how they are using your goods and services. While you can’t be everything to everyone, you can certainly let them know what you do well! Inspirational articles that give people something to think about and feel good about themselves. The better people feel after reading your newsletter, the better the impression they will have of you and your business. Remember, you want them to associate a “feel great” mentality to you! You might include inspirational quotations, or articles about ways to improve their performance, health, or attitude. Testimonials that reinforce the idea that you are the best person to be doing business with. This is a huge point. People like to be part of the “in crowd”, and testimonials further cement the idea that doing business with you is the right thing to do. Use your newsletter as a direct response opportunity. While your newsletter should not be filled with ads and information about you and your company, you should not be shy about asking for referrals, providing special offers to people who refer other customers to you is just good business. Go into partnership with another small business. Combine your efforts. Is there a restaurant nearby? Can you purchase discounted gift certificates from them, and give them to customers who refer paying customers to you? Get creative. Unite with other small businesses and make it worthwhile for clients and customers to do business with all of you. Start off with a page or two…the important thing is to just get started today! You can pretty things up later, consider it to be a “work in progress”. 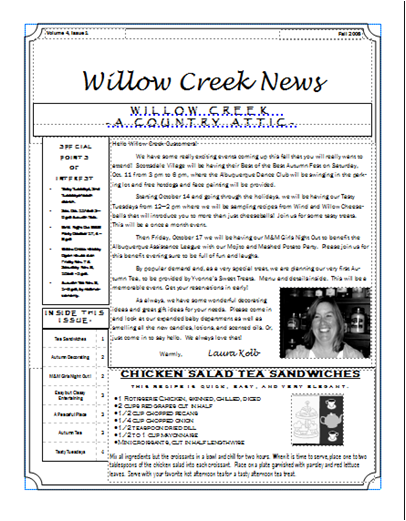 The next several postings will cover newsletter creation ideas in a lot more detail. It used to be that you had to market to your customers on a regular basis, reaching out to them at regular intervals with more and more messages about how and why they should do business with you. Let me tell you my friends, things are changing! Blogging – WordPress, Blogger, etc. …customer behavior and expectations are changing, moving from the “old way” to the new way. If you aren’t a presence on the internet, you are MISSING OUT ON A LOT OF MONEY! A young woman wanted a camera to take on vacation and so she asked for advice from her friends on Twitter. A CMO (chief marketing officer) for Kodak was on Twitter, monitoring for this type of query. He reached out to her and suggested one of Kodak’s least expensive cameras that might be a solution for her situation. This is a 6+ billion dollar company! And they are on Twitter, chatting with their customers about the pros and cons of an inexpensive camera. How incredibly powerful is that? It used to be that to get in touch with the executive of a huge corporation, you really had to have connections. Today, if you want to stay in the running for business, you need to be using social media. A recent article caught my attention about a local Phoenix restaurant, Z-Tejas. One of their customers was really unhappy with a recent visit to their restaurant and tweeted about it. Instantly, one of the owners of Z-Tejas contacted their unhappy customer and sorted out the matter. Had they not been monitoring Twitter, they would have NEVER known how unhappy this person was, and that they were tweeting about it to anyone on their list. I’m not as active on Twitter as a lot of other people, but my list is over 400 people. Would you like 400 people to read about a bad experience? Or would it be better to have 400+ people see that you appreciated how much of a problem this was for one of your guests, and you actually took steps to fix the problem? Believe me…negative advertising can cost you a LOT of money. By monitoring Twitter, being attentive, and alert to a problem Z-Tejas was able to reach out to this unhappy customer and fix the situation. This kind of advertising is worth its weight in gold! Today, people Google everything. According to the February 2010 study from Compete.com blog, 3 out of 5 customers all use search engines when shopping for something, and that includes when they are shopping locally. They want to know who has what they’re looking for. Not using social media can be killing your business. Everyone who knows me understands how important shopping locally is to me. 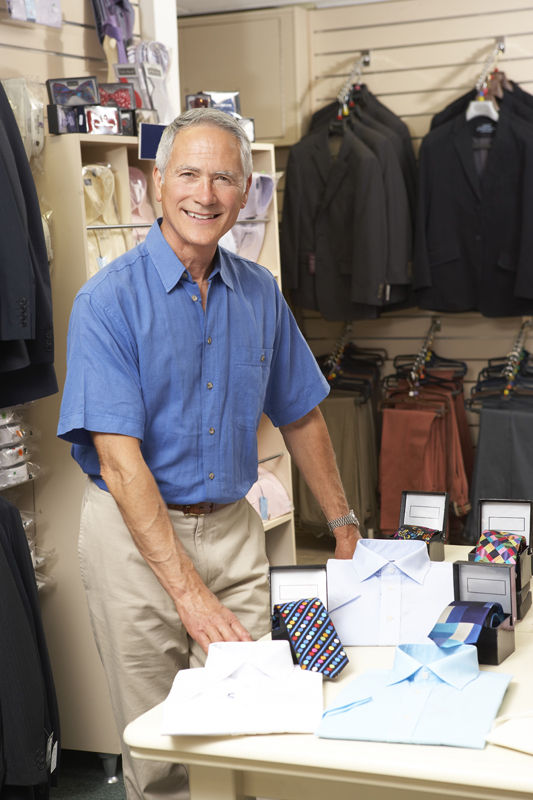 If you don’t let your local customers know about you, how interested you are in them, their concerns, and how you might be able to help, they will find someone else to solve their problems. And, very often, that is money you won’t be collecting, and if it isn’t local, the entire community suffers. To that end, I can be found on Twitter as @KathleenBirming and @SmallBizBits. I can also be found here on Facebook as Kathleen Birmingham. And if you want to stay up on my Small Biz Bits, please “like” my page here. The news is pretty similar to everyone around the country, local biz, large and small, is suffering. As I go out and interview small biz owners in the community here, many of them are really working to keep their people employed, but admit that it is hard to provide all the hours that their employees want or need. Remember to shop locally. Even when you can spend a little bit less because you don’t have to pay sales tax, those dollars spent locally can mean the difference between someone keeping or losing their job. I’ve even managed to change the thinking of immediate family members, by talking up the “shop local” idea. Most folks don’t understand just how difficult it is to keep our economy going, especially when we’re all trying to stretch our hard earned dollars by shopping for bargains. Some of the bargains are found in the big box stores, and sometimes it just doesn’t make sense to pay a large percentage more. Next time, try this, go to a local store owner and tell them your dilemma. You want to shop locally, but their price for a specific item is just too high. See if the good old “let’s make a deal” method can give you a better price than you would have gotten, and your local shop owner made a sale. Remember, it’s our local economy we need to worry about, so keeping our money local is critical!